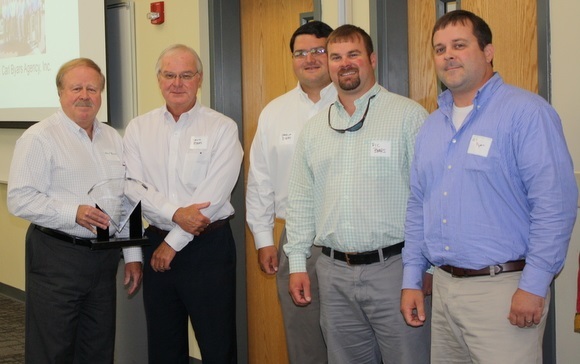 On May 28, the Greater Easley Chamber of Commerce hosted its 3rd Annual Small Business Awards Luncheon at Tri-County Technical College-Easley Campus. The featured speaker was Ted Pitts, President and CEO of the South Carolina Chamber of Commerce. In addition, the Chamber honored several businesses and individuals for their leadership. Among those awards, R. Carl Byars Agency, Inc. was honored as the 2015 Pillar of Easley, which recognizes and honors a long-standing business that plays an active role in our community and is highly respected as an important contributor in making our community strong, vibrant and successful. R. Carl Byars Agency has served the Easley community for 67 years. In November 1947, after returning from World War II, Carl Byars began a real estate and insurance business on Pendleton Street in downtown Easley with two employees. Much of his time was devoted to finding homes for veterans. But as time passed, he began writing insurance and it became a larger part of the business. About 1954, he moved the business to East First Avenue, where the business continues today. Interestingly, Carl was a 1925 graduate of the original Easley High School....and their current office is located directly behind the school. Carl and Frances had three sons. Their first son, Richard, began with the business about 1968. Richard passed away 1975. Another son, Kenneth, returned from the Navy Reserve and began working in the agency. And shortly thereafter, David returned home from college and began his career with the family business. Today the sons of Kenneth, (Gil and Ric), and the son of David, (Charlie), have made this a three generation business with 20 employees. Much of the company’s success can be attributed to their devoted employees, four of whom have over 30 years of service with the company. Also, over the years, the company has supported many organizations and causes in the Easley community such as the Boy Scouts, YMCA, Baptist Easley Hospital, Rotary Club of Easley, Greater Easley Chamber of Commerce, Easley Downtown Business Association, and the development of JB Red Owens Sports Complex. Kenneth and David have a strong belief in family and continue to operate the business as their father would have wished. Carl Byars always said, “It is easy to do business in Easley”! Please join the Greater Easley Chamber of Commerce in honoring R. Carl Byars Agency, Inc. as our 2015 Pillar of Easley.